DKSH has been placed among the top 100 employers of choice at the Malaysia’s 100 Leading Graduate Employers Awards 2018. DKSH also won the top spot in the Shared Services Sector Awards. 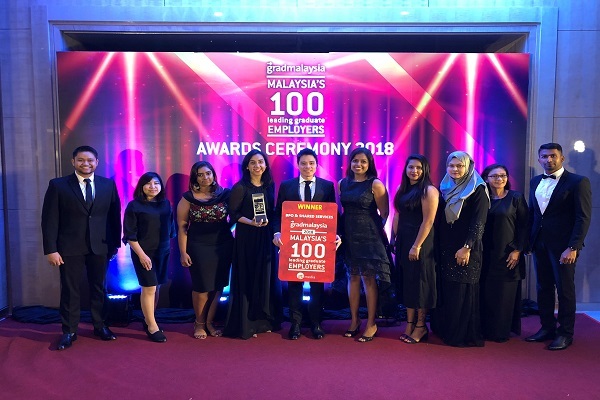 Petaling Jaya, Malaysia, November 9, 2018 – DKSH, the leading Market Expansion Services provider with a focus on Asia, made it on Malaysia’s top 100 most popular employers list, ranked by university students and graduates in the Malaysia’s 100 Leading Graduate Employers Awards 2018. DKSH also won the top spot in the Shared Services Sector Awards, which was a new award category presented for the first time this year. Organized by GTI Media Sdn. Bhd., Malaysia’s 100 (M100) ranking this year recorded 36,207 votes from university students across the country, as gathered via the annual Malaysia Graduate Barometer. The M100 ranking is the largest and longest-running study on graduate recruitment trends in the country. DKSH’s employer value proposition to “Drive growth. Be the difference” promises employees a world of on-the-job learning and development. It also promotes a unique culture where employees can shape their career and take business responsibility, while taking the opportunity to make a positive impact on the lives of others.